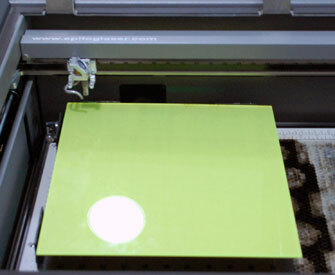 Cutting acrylic with a laser opens up a wide variety of projects that you can create. 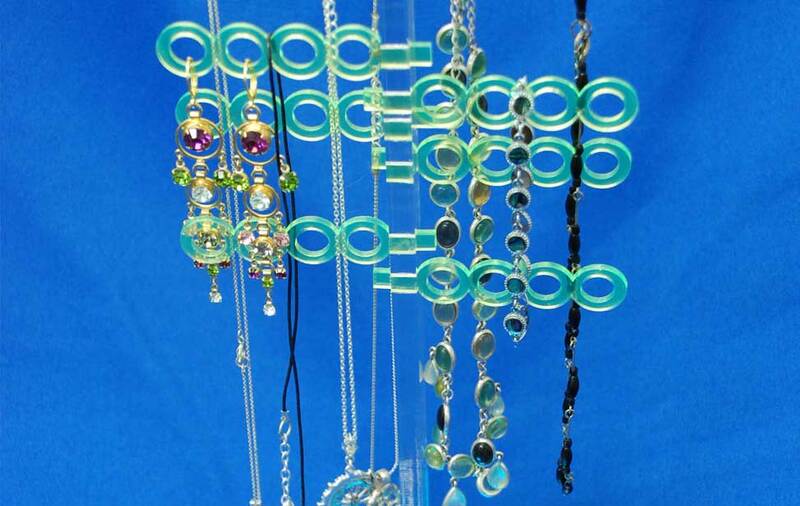 The variety of colors, widths, and textures of acrylic allows our customers to create a great assortment of one-of-a-kind pieces. Here we are using a colorful array of acrylics to create a fun jewelry tree to help organize rings, earrings, necklaces and bracelets. This colorful piece would look great in a teenager's room and is entirely scalable so you can change the size to be as large or small as you'd like. Change the colors or add a name or thoughtful quote to truly personalize the tree. 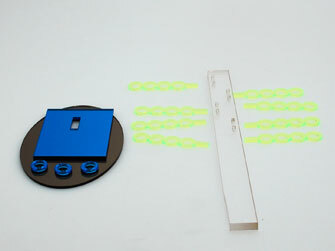 This bright colored jewelry tree is all cut by a laser! 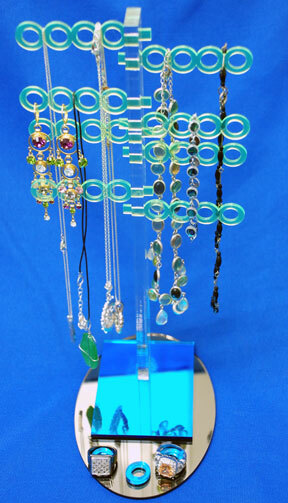 Assemble the pieces of cut acrylic to create your own jewelry tree. Acrylic of varying widths. Our accent pieces were 0.125" thick and the clear trunk was 0.375" thick. Please note: Prior to cutting and assembling all the pieces for this sample club, do a little testing first. Your laser wattage, acrylic manufacturer, width of acrylic and other variables will effect the size of the cuts. While the measurements in the file worked well for the 50-watt Helix we used for the project, your results may be slightly different. You may need to adjust lengths and widths to ensure your pieces fit together properly. After you've determined the cut sizes for this project, follow the steps below to complete it. 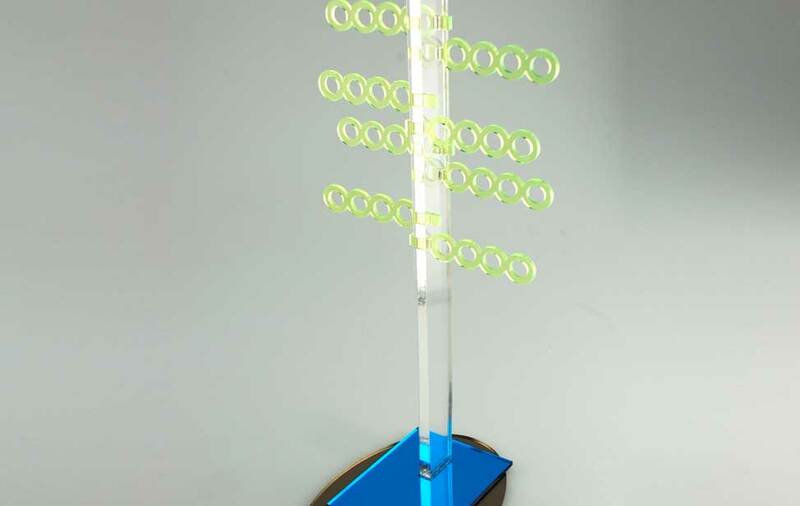 .125" acrylic: 15% speed, 100% power, 5000 frequency. .375" acrylic: 3% speed, 100% power, 5000 frequency. Start by doing a test cut of your acrylic. When you've determined your speed and power settings it's time to cut your pieces. We recommend using the vector pin table for this sample, as it ensures smooth cut lines. After your pieces are cut, it's time to start assembling the tree. You can use acrylic glue in this process to provide extra stability. Begin by gluing the three blue accent rings on the base. Stack the blue square on top of the base. Next, insert the clear tree trunk. Lastly, insert the green branches in the slots, alternating sides. You can elect to glue any of the non-accent items in place for extra stability.